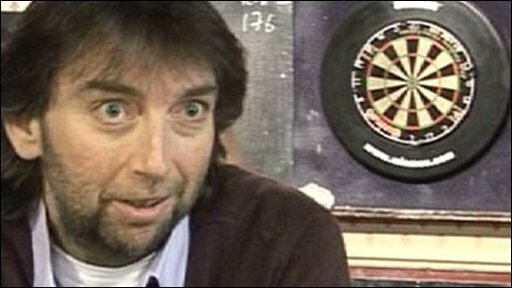 Professional darts player Andy 'The Viking' Fordham was a man hitting all the wrong numbers. Thirty one - the number of stones he weighed; 23 - the bottles of lager he drank daily; seven - the number of takeaways he had each week; and one - the liver he was rapidly destroying. It came to a head last year when he collapsed at a tournament, prompting doctors to warn him to change his ways or face certain death. But now after losing 17st (108kgs) and stopping drinking Andy is stepping up to the challenge. The former world champion has done so well that he has been removed from the emergency liver transplant list - with doctors predicting he will not need one now for maybe five years allowing his body to build up strength. The 46-year-old said the doctors had given him a terrible wake-up call. "They told me if I carried on drinking I would be dead within 10 years, which is kind of hard to take in," he said. "I was really surprised when they said I had a liver problem it is just one of those things you don't think will happen to you. It is always someone else." He started drinking at the age of 13 and said it had spiralled, but that at first his football passion had kept his weight down. 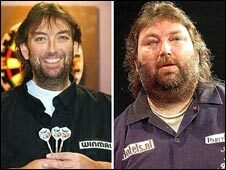 But joining the local darts league and drinking with the players combined with a back injury, which stopped him exercising, took its toll on his body and he started piling on the weight. "I don't know why I got so hooked. I think it was because I was not a falling over drunk," he said. "I used to use drinking as an excuse for everything that I did. "At the height it was just so bad I would have at least a crate of lager, spirits and probably two bottles of wine. Right from the start I thought if I didn't drink I couldn't play. "Drinking was part and parcel of the darts circuit but now they have tried to stop it. "We were just surrounded by drink. "But I was not worried about my health at all because at the time you just don't realise there is a problem. "Then I started getting out of breath quickly and that was the first time I realised that there was something not right, but I would still not face up to it. "When I played Phil Taylor in 2004 in a head-to-head I had to stop because I nearly collapsed and that was the first major sign." But Andy, unaware of the damage he was doing his liver, ignored the warning symptoms. Three years later he collapsed at the world championship. "I went to the tournament and when it came to my turn to play I just said to the officials I can't do it," he said. "I couldn't breathe and they carted me off to hospital. "That was when I was told that my liver was knackered and that a build-up of fluid was crushing my lungs." He had had 16 litres of fluid drained from his lungs and suffered a minor stroke. After he recovered he vowed to adopt a healthier lifestyle and as well as stopping drinking alcohol, he started to exercise more and cut out high fat takeaways. "I feel so much better it is unreal and now I am even drinking water, which is something I would never touch." And with his health returning, Andy is aiming to resurrect his darts career which has been stagnating for the past 12 months. His consultant, Dr John O'Grady, from London's King's College Hospital, said the dart star's drinking had been 'astronomical', but he was delighted by his recovery. Dr O'Grady said the liver could sometimes recover from years of abuse, as was the case with Andy. Tests had shown an encouraging trend of improvement in his liver function, which could mean that a transplant could be postponed for some years. However, he will need surgery at some time. "What is happening is a phenomenon we see happening with alcohol-related liver disease - when you stop drinking the liver can, in some patients, recover very substantially," said Dr O'Grady. "About 3% of the patients on the waiting list recover to a greater extent than we are expecting and Andy was definitely one of those, but we must not give the impression that he escaped a transplant. We could turn around in three months and say it is back to plan A." But he added at the moment it was looking good. "He still does have some fluid retention, but everything else is improving and he is getting his energy back and has a reasonable quality of life." The British Liver Trust hailed Andy's achievement as an inspiration to people committed to improving their health. Alison Rogers, the charity's chief executive, said: "Andy's achievement is an inspiration. It shows that you can change your health through your own personal action. "It takes a huge commitment to make lifestyle measures that can have a sustained impact on your health and can be incredibly difficult."